Welcome to an article on an important new functionality on our SharePoint 2013 and Office 365 site which is none other than “Design Manager”. Branding is everything now among all organizations. A site should have it all to attract its users. 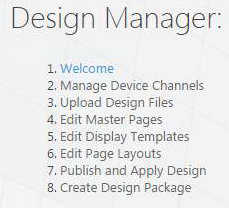 Earlier, SharePoint Designer was an extra tool to do so but now we have Design Manager right at your site collection. You have to enable your publishing feature on your site collection and you will have a list of features available on your site settings of the site collection. All the above have awesome functionalities which will help you to do a lot of things with your master pages, page layouts, html and css files all in here. In this article we will start off with the eight configurations “Create Design Package”. Here under Create Design Package, we will be able to create a design package using Design Manager where you have to just give a name to your package and decide whether you want to include search configuration in this package. After some time you will see the link to download the package. You will see the link below, “Your package is ready. Click here to download.” click on it. Your wsp will be downloaded with the complete package of your design, which you can use in other sites. Hence we are at the last part of the Design Manager. Here we saw today an article on Design Manager in SharePoint 2013 & Office 365 with the eighth configuration panel ‘Create Design Package’ on the list. Keep reading and keep learning.